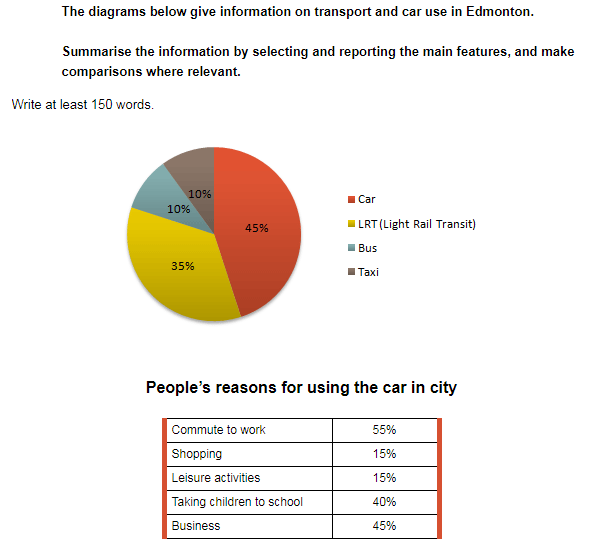 The diagrams below give information on transport and car use in Edmonton.Summarise the information by selection and reporting the main features, and make comparisons where relevant. Essay topics: The diagrams below give information on transport and car use in Edmonton. Summarise the information by selection and reporting the main features, and make comparisons where relevant. The presented pie chart illustrates the proportion of transport and car use in the Edmonton. At the same time, the reasons of car using in this metropolis are showed in the table. As can be clearly seen from the diagrams that car is the dominant choice among four kinds of vehicle namely car, light rail transit, bus and taxi. Additionally, the major purpose for driving the car is commute to work. According to the pie chart, the percentage of car used to travel accounts for 45%. 35% is the proportion of light rail transit use in Edmonton. Moreover, bus and taxi have the same ratio of use, standing at 10%. Turning to the table, the commute to work purpose constitutes 55%, which is highest percentage. There are 45% and 40% causing for business and talking students to school, respectively. The ratio of free time activities and shopping are just 15%. Message: Consider using a past participle here: 'commuted'. Message: A determiner is probably missing here: 'is the highest'. No of words: 150.0 196.424390244 76% => More content wanted. Unique words: 92.0 106.607317073 86% => More unique words wanted. Sentence length SD: 23.7867610237 43.030603864 55% => The essay contains lots of sentences with the similar length. More sentence varieties wanted. Discourse Markers: 1.2 5.23603664747 23% => More transition words/phrases wanted. automated_readability_index: 8.5 13.2329268293 64% => Automated_readability_index is low. linsear_write_formula: 6.5 11.4329268293 57% => Linsear_write_formula is low. text_standard: 7.0 11.0658536585 63% => The average readability is low. Need to imporve the language.